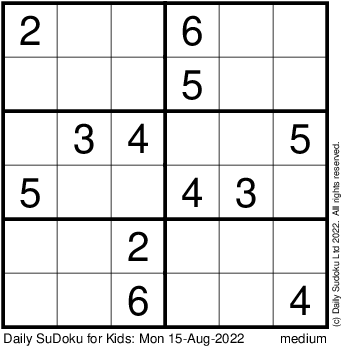 Try a new Sudoku puzzle by visiting this page every day. They're great fun and this kids' version isn't too tricky. For HARD puzzles, every row, every column and every 3x3 square needs to have the numbers 1 to 9 in. For MEDIUM puzzles, every row, every column and every 3x2 rectangle needs to have the numbers 1 to 6 in. Can you work out the missing numbers?